This has been an unusually busy year for me. Wedding (not mine! Ah girl and Matt's), travel, work, ... as I looked back, I now realize I have traveled closed to 90,000 miles. A suite at W the Court (that's bigger than my previous apartment), with a view of the Chrysler building. Multiple suites at the Sheraton NY, with a small view of Times Square and Central Park. Also received a bottle of wine and fruits after an issue that came up during my stay. I have stayed in NY for many years, with the last five years at my beloved new apartment close to Times Square. So it absolutely crushed my heart to leave NYC for an extended period of time. Since CX introduced flat seat in their business class last year or so, I've been fortunate enough to be on them on numerous occasions. The flat bed was quite comfortable, but the food was not that good. I missed the good food and excellent service on JAL. Upon arriving Hong Kong, I was put up in a temporary service apartment in Lan Kwai Fong. Apartment size was good, but no where close to the 1,000 sq ft they claimed! Since I needed to get a new cell phone, I decided to go with the iPhone offered by “three”. Couldn't get the 16G phone as there's a waiting list. I am not a very patient guy, so 8G it is. In exactly a week, I had to go to Bangkok. Attached was a view from my club room. I loved Bangkok, and their Thai service. But what I enjoyed most was the mangosteen in my room! After having one, I couldn't resist but went out to get a bunch more from the wet market that night. Singapore had changed a lot. In fact, I really enjoyed my short time there as well. I was at the Fullerton Hotel so it was a very short walk to the Merlion. The exterior of the hotel reminded me of Hotel Excelsior in Rome (shown in the third picture). 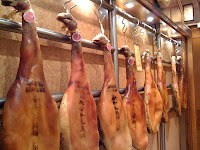 The Chinese food in HK was mouth-watering delicious. I have found my new favorite dish ... the “flying goose” of Yung Kee. 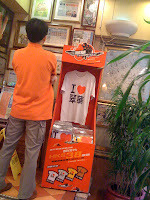 I also had to take picture of the T-shirt of Tsui Wah since it reminded me of NY. 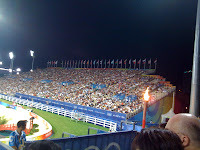 Since the Olympic's equestrian event was held in HK (Shatin), I was able to go watch the jumping event. The next morning, I left for Tokyo. I was able to fly my first international first class ever due to a very unique situation. Cathay's first class was truly amazing! And, what surprised me was that the seat was really at the front of the airplane. I wondered if the pilots were up on the upper level? CX's first class had the most beautiful airplane restroom I ever seen, with a few windows looking out to the blue sky when you fly. None of my pictures of Tokyo came up good enough to be posted here. But I did enjoy the Tokyo Conrad, which had good service and a huge room. This was the highlight of my trip. I was very excited to try out JAL’s new JAL Suite in their First Class. Service, as expected was impeccable. I changed into the relaxed dress provided before the plane taking off and was able to truly relax my flight. When I was ready to go to bed, the flight attendant would come make my bed. They would bring along a tempur-pedic mattress to put on top of my flat bed, and along with that a down duvet and another down pillow. While the experience was superb, I found CX's first class suite to be better designed than JAL's. I was suprised I would come to this conclusion. I didn't expect to be returning to NY this soon. I always love New York! I spent last week in Taipei and fell in love with the country. Its people were very friendly, and the food was cheap and good. 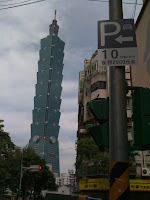 I stayed at the Hyatt by Taipei 101, so I couldn't help but took a few shots of the world's tallest building. 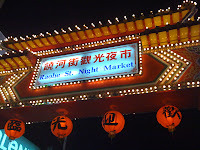 I also frequented 3 different night markets. On my way back yesterday, I ran into street demonstration, so I snapped a shot from my taxi cab. Now I am back here .... and still suffering from jet lag! Oh... you are moving to Hong Kong... wow.. you seems to travel a lot these days... best of luck in your new life!